Snappii :: What is the NearbyTab? Nearby Tab perfectly suits businesses with multiple locations. 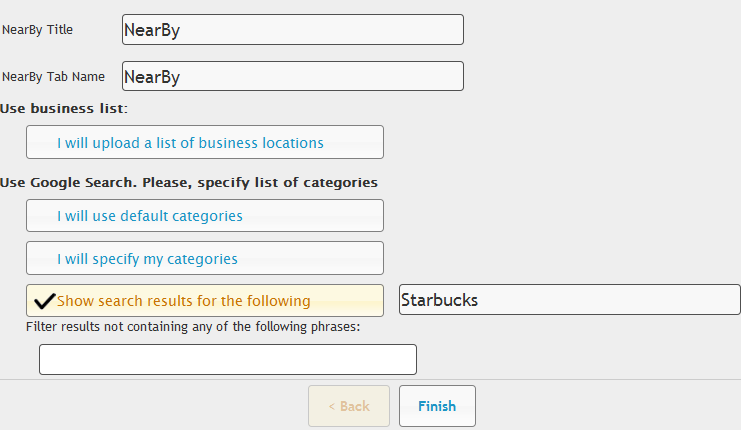 All you need to do is enter the name of your business, and it will show up in Nearby wherever user happens to be. Just imagine how convenient it is! You can always drive users to your nearest location.\n\nWhen you modify the Nearby button, you will see several options to specify the locations.\n\nFor example\n\n–you can upload a list of your business locations\nIf you want to show a list of your business locations, simply upload Excel file which contains:\n\n-the name of needed location (for example AMC Cardian Lodge);\n-it’s Url (http://www.outdoors.org);\n-address (774 Shem Valley Road);\n-city (Alexandria);\n-region (NH);\n-country (if it’s not located in USA);\n-postal code (3222);\n-phone numbers;\n-emails addresses;\n-logo link (http://www.yvts.co.uk/images/bibicon/casestudy.pgn);\n-notes (if you want to show more details);\n-description of that business.\n\n \n\n–use default categories;\n–specify your own categories;\n–show search results for a specific keyword.\n\n \n\nYou can even Filter results that don’t contain any of the particular phrases.\n\nFind more in our User Manual.